In the childhood when I was little, spectacled, among courtyard friends not very popular girl, an important part of my life had become the books. I was engorging them. Nothing was as good as trip to the magical world of books, in which used to find everything – adventure, wisdom, love, knowledge, compassion. Often I read books not for a single time, but there is the one which sheets just teared of the continuous moving procedure. 1844 Alexander Dumas senior created rare magnificence masterpiece in which everyone who was disappointed, issued or disadvantaged in this world found solace that one day retribution will inevitably come, and the offenders will have to pay the bills accumulated abundant. I am speaking about the famous Frenchman novel “The Count of Monte Cristo” about stunning crime and revenge story with fascinating plot and richly decorated, from which to the reader simply takes away the breath. Not only the book brought the happiness but also latter seen films one way or another showing the classic story. I have seen at least seven different “The Count of Monte Cristo” up building, one was better than other. And now, when it looked that everything about this topic have been said, 2011 JAV television ABC released to the world one more revenge story, but this time, as befits XXI century, the main heroine of story, implacable angel of revenge became a women. Serial „Revenge“ – tells about how to the one seaside town of higher society joins girl with not her name and kept on reasons that only she knows starts deliberate and systematic destroy everyone life. Need to rejoice that story is created well, tension and intrigue kept well all the time. Main actress Emily Van Camp fresh and interesting face, other actors also seen for the first time for me. All the actors I evaluate as big this TV show merit, troupe works as well matched individual talents team. Some limitations of serial finds out just at the end of the first season in which is 22 series. For my taste „Revenge“ could be even more gloomier when situations are solved too easily but it is not a reason not to watch this serial. So, the evaluation. Originality: I can‘t give a lot of points in this category because, as I have said “Revenge” made reference of the classical story, so 3/5. 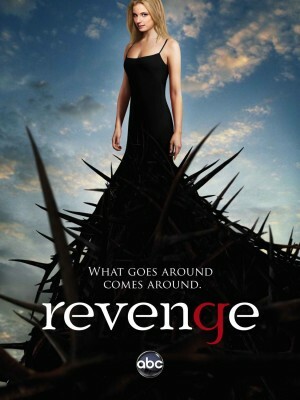 Plot: again the same situation described in the category of originality, so again 3/5, but don‘t rush to write it off.